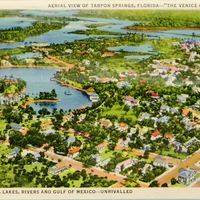 A postcard depicting an aerial view of the town of Tarpon Springs, Florida, and all of its waterways. The earliest Americans settlers to Tarpon Springs came following the American Civil War. The town was first promoted by Hamilton Disston (1844-1896) as a town for relaxation and health. In early 1987, Tarpon Springs became the first city to be incorporated on the Pinellas Peninsula. The Orange Belt Railway first arrived in 1887 and sponge harvesting became a prime industry in the area. Tarpon Springs thrived during the Florida land boom of the 1920s and collapsed when the rest of the state bust in 1926, which also saw the devastation of a major hurricane. Despite the land bust and the Great Depression, the sponge industry continued to thrive until 1938, when a blight infested the sponge beds. Instead, the city turned to tourism, capitalizing on its rich Greek culture. Original 4 x 6 inch color postcard by the Gulf Stream Card and Distributing Company: ACC# SM-00-243, file folder 1 (U.S. blanks), box 10A, Lucile (Mary Lucile) Campbell Collection, UCF Public History Center, Sanford, Florida. Digital reproduction of original 4 x 6 inch color postcard by the Gulf Stream Card and Distributing Company. File folder 1 (U.S. blanks), box 10A, Lucile (Mary Lucile) Campbell Collection, UCF Public History Center, Sanford, Florida. Lucile Campbell Collection, Student Museum and UCF Public History Center Collection, Seminole County Collection, RICHES of Central Florida. Originally created by Gulf Stream Card and Distributing Company and published by Curt Teich and Company. "Timeline." History of Pasco County, Florida. http://www.fivay.org/tarpon_springs1.html. "Local History." Tarpon Springs Area Historical Society. http://www.tarponspringsareahistoricalsociety.org/Local-History/local-history.html. Gulf Stream Card and Distributing Company. 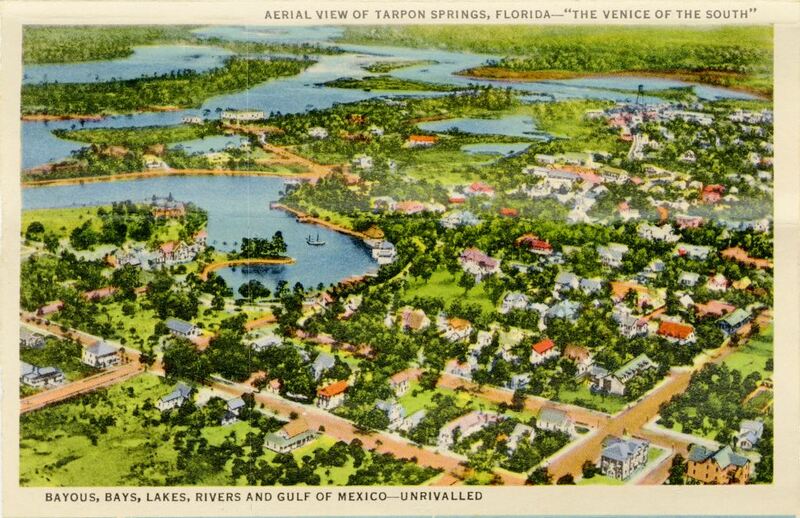 “Aerial View of Tarpon Springs, Florida—"The Venice of the South" Postcard.” RICHES of Central Florida accessed April 18, 2019, https://richesmi.cah.ucf.edu/omeka/items/show/6820.